Given the insane 2014 winter hitting many parts of the nation, Miami is a hot spot right now – literally! If you find yourself in the area before February 23rd – we suggest making time to visit the out-of-the-ordinary Coral Gables Museum with your tweens and teens. Our amigos at Ford in partnership with ARTcycle are hosting a unique exhibit to raise awareness, respect and tolerance for cyclists, promote cycling and reduce the number of bike-related accidents in Miami. Among the presenting artists is mom and environmental advocate Nancy Martini. Her works draw you in to the exhibit with their large visual and detailed presentation. 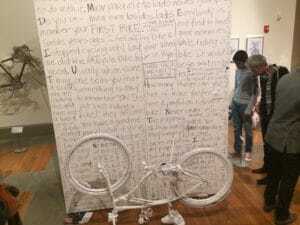 Her entry – The Accidental Beast- was created in conjunction with Art Basel Miami and inspired by seeing her thirteen-year old son get hit by a car while riding his bicycle to school. While he escaped with only minor bruises and scrapes, she knows it could have been much worse. Nancy explained to our tween reporters Sophia & Olivia that while drivers have to pay close attention to cyclists on the roads, bikers too have to be very vigilant about their own safety. While at the exhibit you can take Ford’s ‘I Pledge To Drive Safe’ promise and clearly communicate driving safety to your kids. Parents truly are the best role models and surely tweens and teens will be driving soon enough! The Coral Gables Museum is located at 285 Aragon Avenue, Coral Gables, FL 33134. There are activities relating to the Ford ArtCycle Miami exhibition happening almost everyday including weekends through February 23rd. Safe roads- for drivers and cyclists- are important for every family. This entry was posted in Teaching & Education Tips and tagged art, bikes, cycling, Driving Safety, padres, parents, saf, teens, Tweens. Bookmark the permalink.